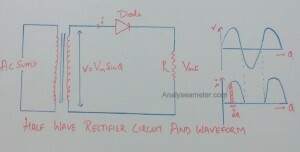 In Half wave rectifier, the diode conducts only for positive input voltages i.e. one-half of the AC wave is removed because it cannot pass through the diode. As the name indicates it rectify only half of the input wave through the phenomenon name as rectification. 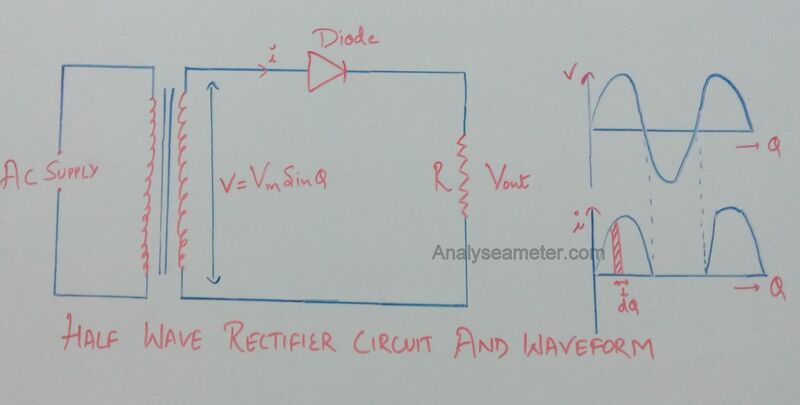 In our previous tutorial, we gave information about half wave rectifier circuit, Rectifier, Diodes, Diode types etc. In this article, we explain the mathematical expression of an efficiency of Half wave rectifier and its uses. For the determination of the efficiency of half-wave rectifier consider the circuit diagram shown in Figure below. Let rf and RL be the forward resistance of diode & load resistance, v = Vm sin θ be the voltage appearing across the secondary of the power transformer. During the positive half cycle, the diode is forward biased makes the current to flow through the load resistor while during the Negative half cycle the diode is reverse biased stops the current flow through the load resistor. This indicates that the half wave rectifier can convert maximum 40.6% of AC power into DC power, and the remaining power of 59.4% is lost in the rectifier circuit. In fact, 50% power in the negative half cycle is not converted and the remaining 9.4% is lost in the circuit. It is used for detection of amplitude modulated radio signals. For the welding purpose, it supplies polarized voltage. It is used in many signal demodulation processes. Efficiency is DC power to the load / ac power obtained by the secondary transformer …but the ac power obtained is not DC…it is full wave …then y is the rms value of rectified wave taken into consideration?? See for the negative half cycle there is voltage and current in the primary of the transformer but there is no current in the secondary due to high resistance of reverse biasing. So the waveform of the current is having only positive cycle before entering the diode and coming out of the diode, but no negative cycle. So coming out of it, there is pulsating dc whose output power we calculate. Now before entering the diode the waveform is same, thus if there would be an ac that had the rms value of that current waveform, then what power had it produced is calculated. And thus we solve for the efficiency that what would have been the dc’s effect to that of the ac’s. Thanks, Shivam for the comment. I don’t know how I skipped this question from Preeti. We are glad that people like you are here to help others. In the input ac power expression why we take RMS value of I. Input current is a full sine wave, but in Irms expression we take only 0 to pi value(half wave o/p). Sorry for late reply… here is the solution. Explain why half wave rectifier is called a poor device for rectification?? The answer to your question is already in the article. Maximum rectification that can occur in Half wave rectifier is 40.6%. That means, 59.4% of the signal gets waste in the process. Refer to the equation in the article. Below that, there is an explanation. While the efficiency of Full wave rectifier is 81.2%. That means, only 18.8% of the signal get waste. 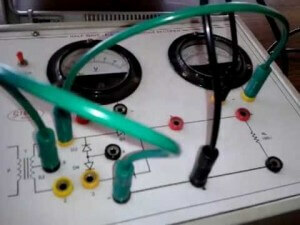 Hence have wave rectifier is called a poor device for rectification. If you have any other question, you can ask in the comment.